BEECHER – It is now up to Will County to protect the 1913 architectural ‘monument’ to the early citizens of Beecher. The Beecher Mausoleum was built to honor Beecher residents, but ironically, today’s residents have forsaken the town’s early settlers. The stark reality was felt by Sandra Thielman of Wonder Lake, IL, a descendent of one of the men credited with building the mausoleum, when she attempted to solicit help restoring the building which had fallen victim to neglect and vandalism. She was further rejected by the members of the Beecher Village Board who even balked when she suggested that the mausoleum be permanently locked and requested that a key be kept at the village hall. Ms. Thielman’s quest for monetary support was met with further refusal. 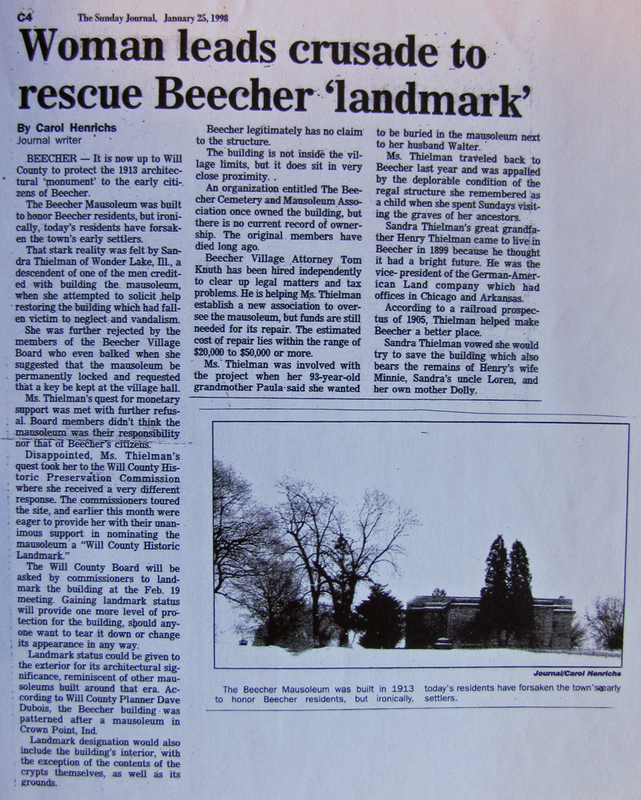 Board members didn’t think the mausoleum was their responsibility nor that of Beecher’s citizens. The Will County Board will be asked by commissioner to landmark the building at the Feb. 19 meeting. Gaining landmark status will provide one more level of protection for the building, should anyone want to tear it down or change its appearance in any way. Landmark status could be given to the exterior for its architectural significance, reminiscent of other mausoleums built during that era. According to Will County Planner Dave Dubois, the Beecher building was patterned after a mausoleum in Crown Point, Ind. Landmark designation would also include the building’s interior, with the exception of the contents of the crypts themselves, as well as its grounds. Beecher legitimately has no claim to the structure. The building is not inside the village limits, but it does sit in very close proximity. 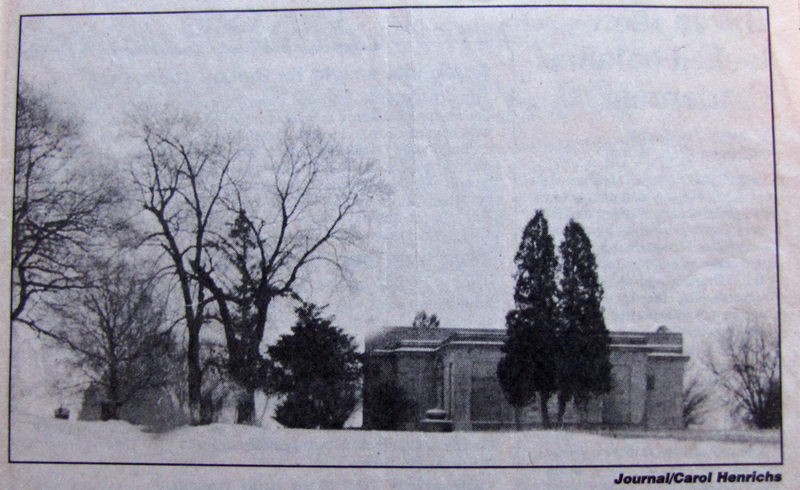 An organization entitled The Beecher Cemetery and Mausoleum Association once owned the building, but there is no current record of ownership. The original members have died long ago. Beecher Village Attorney Tom Knuth has been hired independently to clear up legal matters and tax problems. He is helping Ms. Thielman establish a new association to oversee the mausoleum, but funds are still needed for its repair. The estimated cost of repair lies within the range of $20,000 to $50,000 or more. Ms. Thielman was involved with the project when her 93-year-old grandmother Paula said she wanted to be buried in the mausoleum next to her husband Walter. Ms. Thielman traveled back to Beecher last year and was appalled by the deplorable condition of the regal structure she remembered as a child when she spent Sundays visiting the graves of her ancestors. Sandra Thielman’s great grandfather Henry Thielman came to live in Beecher in 1899 because he thought it had a bright future. He was the vice-president of the German-American Land Company which had offices in Chicago and Arkansas. According to a railroad prospectus of 1905, Thielman helped make Beecher a better place. Sandra Thielman vowed she would try to save the building which also bears the remains of Henry’s wife, Minnie, Sandra’s uncle Loren, and her own mother Dolly.